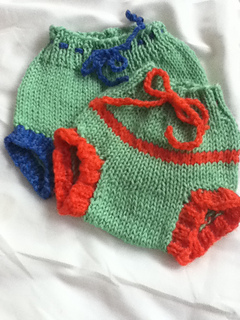 This pattern is for knitted, pull-on diaper soakers. The sizes range from preemie to x-large and there are also directions for customizing the fit to your baby. 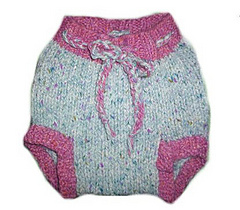 It is knit in the round with heavy worsted weight wool yarn and features ribbing in the legs and waistband and a drawstring waist.